When did the Nez Perce meet Europeans? Because the Nez Perce lived pretty far from the Pacific Coast, they didn’t meet European travelers until the 1700s AD. That was more than two hundred years later than the Iroquois and Cherokee, and even later than their Chinook and Shoshone neighbors. But their isolation did not protect the Nez Perce from catching European diseases: many died of smallpox that they caught from their neighbors. 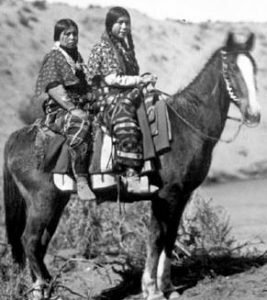 On the other hand, the Nez Perce were also able to trade with the Shoshone to get horses. The Nez Perce used their new horses to spend more time on the Great Plains, hunting bison. 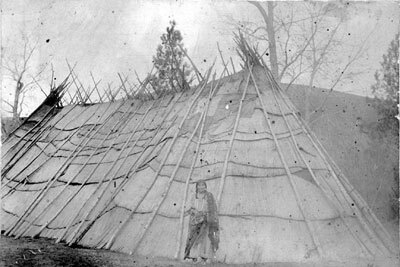 Nez Perce people got enough bison skins from hunting to cover their longhouses and tipis with bison hides instead of grass mats. The bison hides kept people inside much warmer. Not long after 1750, the Nez Perce saw their first Europeans. They were French fur traders traveling along the Columbia river in canoes. In 1805, Lewis and Clark also came through the Columbia Gorge and met the Nez Perce. The Nez Perce were eager to trade with Lewis and Clark in the hope of getting some guns. (Their Shoshone neighbors already had guns). In exchange for the guns, the Nez Perce agreed to take care of Lewis and Clark’s horses for them through the winter. When did the Nez Perce lose their land? Just as the Nez Perce were among the last of the Native Americans to meet Europeans, they were also among the last to surrender to the United States. By the middle of the 1800s, the United States government was pushing the Nez Perce to move to a reservation in Idaho. About half of the Nez Perce agreed to move; the other half fought back for a generation. 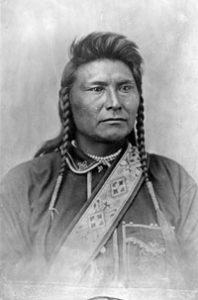 But by 1877, Chief Joseph of the Nez Perce surrendered to the United States Army. It was the last big battle between Native Americans and the United States. Today many Nez Perce still fish for salmon and raise horses. While they control much less land than they did before the Europeans invaded, there are more Nez Perce today than ever before: about 18,000 Nez Perce live on the reservation today. Cite this page: Carr, K.E. Nez Perce and smallpox – American history. Quatr.us Study Guides, August 13, 2017. Web. April 22, 2019.